I had some issues with this story. I liked it. But I had issues. 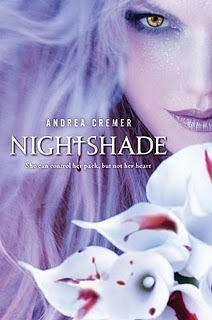 Calla Tor is an Alpha wolf in charge of the Nightshade pack of teens. She has been promised to the Bane Alpha wolf since they're inception. Which just happens to be on Halloween, which just happens to be their birthday. Problem number one. Using a pagan holiday as a rite of passage. Second problem. Calla helps a seeming less helpless guy who is being torn to pieces by a big bear. In the Colorado mountains. Calla easily morphs into wolf mode and feeds said boy her blood so he doesn't die. Said boy is now hopelessly in love with the wolf-girl. Wolf-girl is feeling the pull of the hapless guy. Shay Doran is a boring character. I didn't get the whole why Calla and Shay seemed to immediately fall for each other. There was no spark, no electricity. There was nothing there. Yet, Ren Laroche, the male Alpha that Calla is promised to is all sorts of electric, he sends sparks shooting down Calla's back and gets her good and hot. Ren is who I want to see Calla with. He's a much more dynamic character compared to Shay. It was almost like Cremer was writing the book and gave up on Shay and became more enthralled with Ren. I certainly know I did. Ren is the saving grace and what saves this review from giving it two parasols. The situations that Shay and Calla find themselves in are contrived to the point that I couldn't wait for Ren to show up and tease Calla some more. Some of the minor characters are decent. Calla's brother Ansel is cute. His puppy love for Calla's beta is predictable. What is unpredictable is the out couple Mason and Neville. I'd like to see more of them in the next book. Two gay wolves. Interesting. There are twists and turns to keep you guessing and keep you interested in the story when Shay is not around. The history of the Guardians (wolves) and the Keepers (masters) is interesting. The subplot including the Searches (humans) is not fully fleshed out so you have a hard time wondering what they are after. It's not fully explained and that can be a bit of a problem. This installment ends so quickly and so bizarrely that I'm still trying to figure out what happened. So thumbs up to Calla and Ren. Thumbs down to Calla and Shay. I don't normally talk about covers, but this has got one of the prettiest covers I've seen in a long time. Eek! Sad you didn't like it that much, but I'm with you on Ren. I loved him. I find it interesting that you find Shay kind of boring. I rather enjoyed that, because I feel like not every guy is some insanely hot paranormal god, so it's kind of nice to see a girl falling for someone who's kind of average. Great review! In almost every review I see of this book, Ren is the character that's praised, heh. I think I'll have to read this book just to see if I agree with the majority or not! Heather, I think it's the dynamic factor. Ren just (and please excuse my use of this word!) sparkles off the page whereas Shay is just one dimensional. I completely agree with you when it comes to Ren....he's verrrry electric hehe. I also agree with you on the ambiguity of some aspects of the novel. I thought the backstory could have been explained better. Oh one question though - why was it a problem that their rite of passage was on Halloween? I was just curious if it is a personal issue or whether its because of something about Halloween that I wasn't aware of! :) You can check out my review at www.quirky-fate-press.blogspot.com. I totally agree with everything in your review. Especially the Ren part. I love Ren so much. Hehe. Shay bores me, I don't like the Shay and Calla pairing. There's no chemistry, spark, or electricity. I think the only thing I like about this book is Ren. Ren and Calla pairing. I love it when they're together. So I really hope there'll be more Calla-Ren parts in the next book.